 Drawing on politics, literature, popular culture, and his personal observations, Foster (History/Oxford, Modern Ireland, 1600-1971, 1989), the leading authority on modern Irish history, reveals in this gathering of 14 essays (most previously published in academic journals) the intricacies, ambivalences, and illusions behind the Anglo-Irish identity crisis, especially from 18401922. Foster's emphasis is on people: the cultural mediators, the displaced, the dislocated. They are Irishmen, who like himself, lived in England--Swift, Edmund Burke, Boswell, Tom Moore, a century of great journalists. In his concluding essay he calls them ``Micks on the Make,'' as opposed to the ``misfits,'' the ``marginal men,'' the English dreamers such as Shelley, Engels, Lord Randolph Churchill, and Maude Gonne, who found, however briefly, a congenial space in Ireland, or Trollope and Disraeli, who used it as a setting for their political novels. 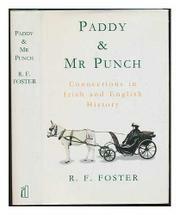 Including popular culture as historical evidence, Foster reveals some of the complexity of these colliding perspectives: Kitty O'Shea's scandalous memoir of Parnell (1914) and the bestial stereotypes of the Irish in the British humor magazine that Foster explores in the title essay shape the Irish sense of national identity both at home and abroad. But it is the diversity of Irishness that emerges from the essays, over a century, over several social and economic classes, through different professions, religions, and even, as in the case of Yeats (about whom Foster is writing a biography), within one lifetime: the poet, in his 60s, turning on the Catholic establishment that had nourished his Celtic tastes and nationalism to recover his Protestant background. However controversial the various topics, Foster handles them with wit, erudition, and civility. In his hands, the irreconcilable differences of the Anglo-Irish tradition and character become creative oppositions.